Etihad Airways is the flag carrier of the United Arab Emirates. It flies to over 120 destinations around the world, and it’s growing rapidly. In 2014, the airline carried almost 15 million passengers, which is roughly a 22 percent increase from the year before. 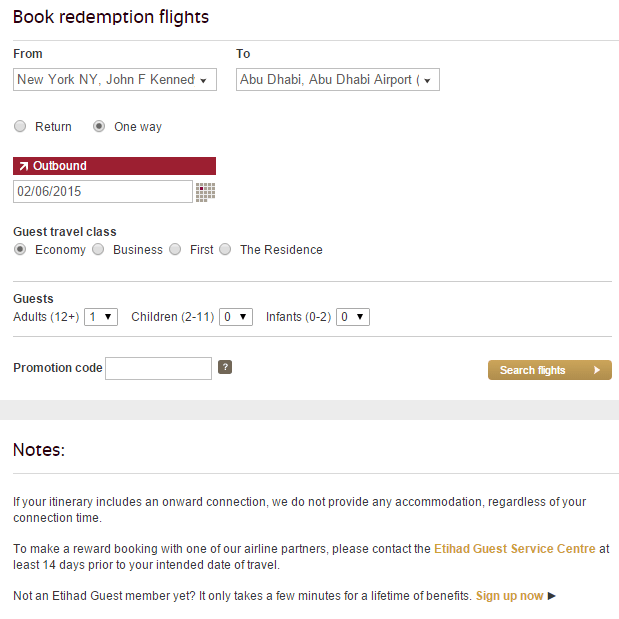 Etihad has an excellent loyalty program, Etihad Guest. Not only does the airline offer superb products and service on their own flights, but you can also use Etihad Guest miles to fly on 23 partners. That’s more airline partners than two of the three major alliances. Etihad Guest is flexible in other ways, too. It has a generous Family Membership program where up to nine people can pool miles into one account. Every family member still keeps their own status miles in order to be eligible for elite levels. 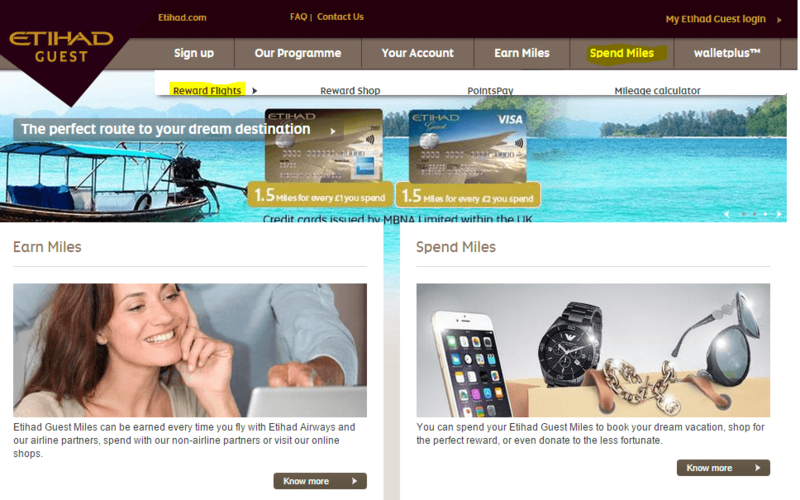 Another interesting Etihad Guest feature is the Miles+Cash online redemption tool. You can redeem an award seat with just one mile and pay cash for the rest of your ticket. Not only that, but the cash portion of your ticket earns miles, as well. Etihad Guest has four redemption levels: GuestSeat, OpenSeat Saver, OpenSeat Value and OpenSeat Freedom. GuestSeat offers the best redemption rates. Book it if it’s available. OpenSeat awards, which are easier to find, can be extremely overpriced, especially for premium cabins. OpenSeat Value offers reduced cancellation fees, and OpenSeat Freedom has no cancellation or change fees. When Should You Use Etihad Guest Awards? Think of Etihad Guest miles as Middle Eastern Avios. The strength of British Airways’ Avios is the affordability of short award flights that may otherwise be prohibitively expensive. For instance, a round-trip flight between New York and Bermuda (about 1.5 hours each way) can cost over $400. An award ticket, though, is just 15,000 Avios. 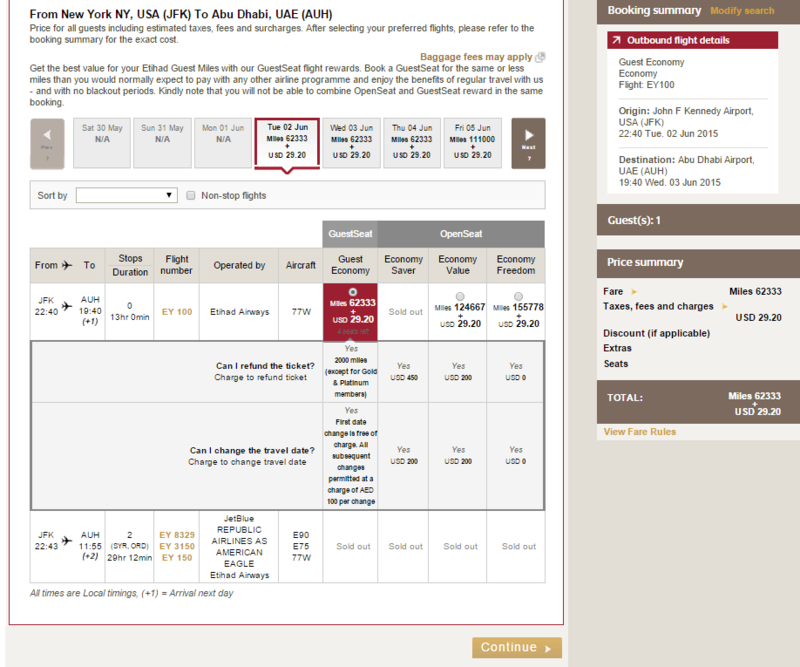 Similarly, Etihad Guest awards can be a bargain for short- or medium-length flights with high cash prices. For example, a round-trip flight between Abu Dhabi and Maldives is about four hours and costs 2,690 AED, or around $750. You can book the same flight for 34,494 miles and roughly $50 in taxes, for a value of about two cents per mile. Short flights within the Middle East often offer an even better value. Many short flights on partner airlines are also a good deal. For example, the one hour flight between Bangkok and Koh Samui runs $150 to $200 on Bangkok Airlines, but you can book it for only 7,500 Etihad Guest miles. 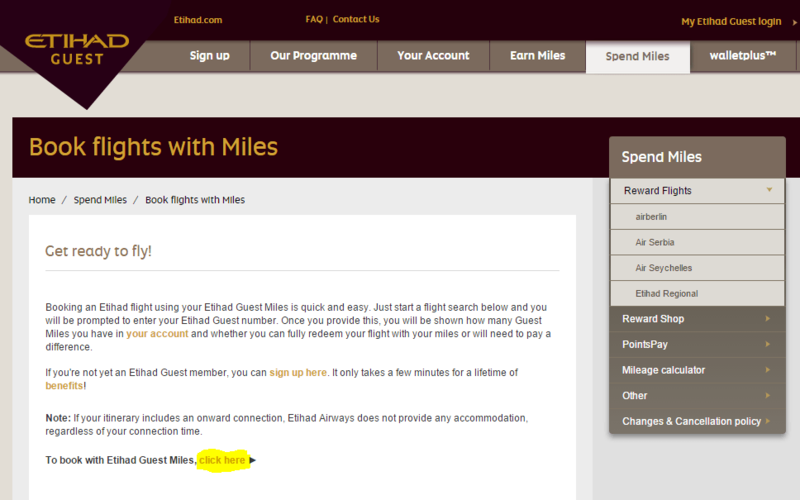 Another great use of your miles is to book premium cabins on Etihad flights. The airline has always taken the idea of luxury very seriously, but last year’s introduction of Etihad First Apartments and the incredible three-room Etihad Residences was a game changer. Cash tickets are astronomically expensive, but they’re probably worth the splurge if purchased with miles. Although a flight in an Etihad Residence would be amazing, it will cost a lot of miles even if you manage to find it at saver rates. You may want to try for a First Apartment instead. Availability is better, and it’s currently the best first class suite in the sky. 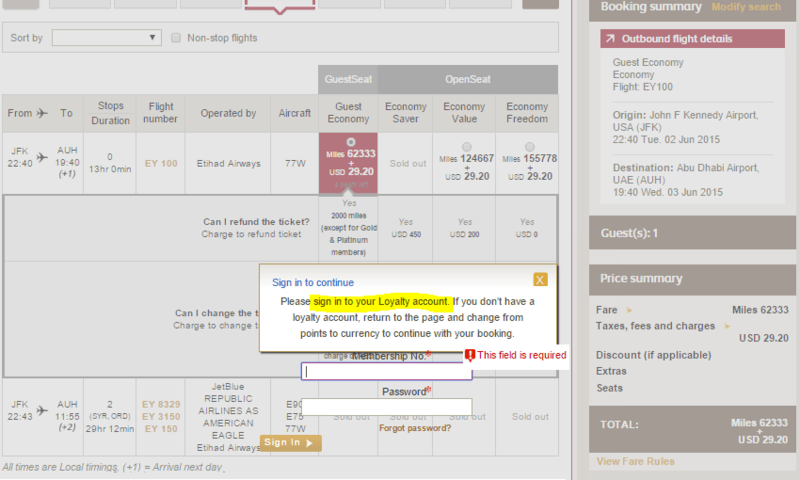 Booking online is easy on Etihad’s website. You don’t even need to be logged in to search for award flights. 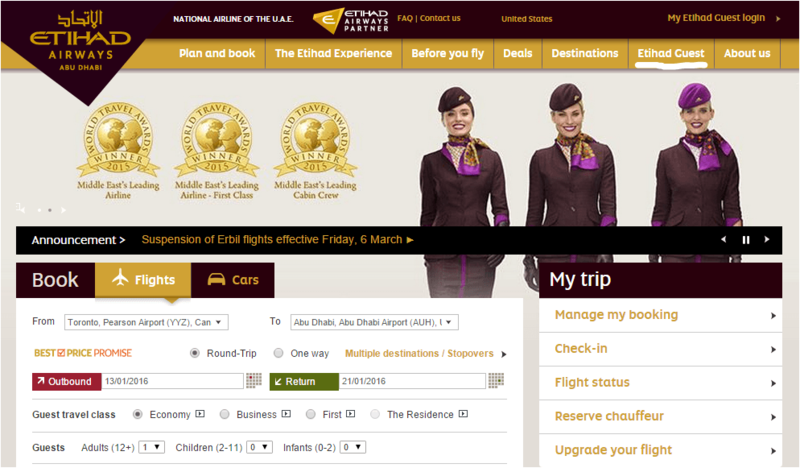 To start your search, go to Etihad’s homepage and click on “Etihad Guest” in the upper right corner. That will bring up the “book flights with miles” page. Hit “click here” at the bottom. Enter your departure and destination cities and dates. Be sure to select one way or roundtrip, and your cabin class. The next screen displays a week of availability for the route. Click on the day you want, and select your flight and fare. Click “continue” at the bottom of the page. If you haven’t already, you’ll now be required to log in to your account. After logging in, you’ll see a summary of your itinerary and costs. The following screens will walk you through the rest of the booking process, including entering your billing information. Etihad Airlines has offices in Chicago, Dallas, Los Angeles, New York, San Francisco and Washington, D.C. The call centers are open 24 hours a day, seven days a week. You have to call Etihad to book flights on partner airlines. Thankfully, there’s no phone booking fee, and Etihad’s agents are typically well-trained and very helpful. If you’re still having difficulty using Etihad miles for flights on partner airlines, you can also seek help from Etihad’s Twitter account or Facebook page.